The encounter was participated in by Iosu Madariaga, Basque government Technology and Strategy Director, who outlined Basque executive strategy with regard to innovation. On his side, Cidetec Director Javier Rodríguez gave a brief exposé on the current reality of the centre and the fields where it conducts its activity. 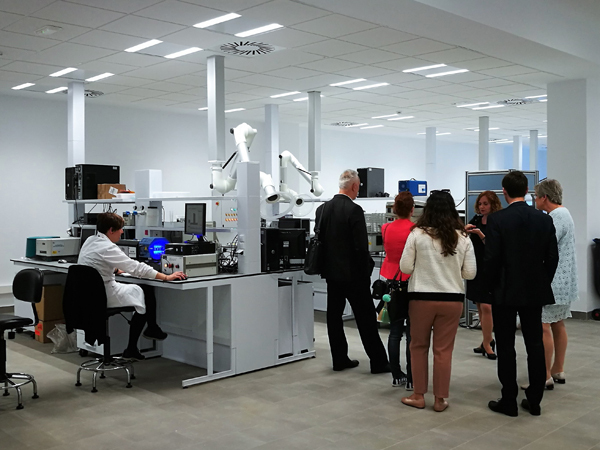 The main part of the event was a tour through CIDETEC installations, where the directors of its three centres (Nanomedicine, Surface Engineering and Energy Storage) served as guides, showing the equipment, capabilities and most relevant activities of each. The visit took place in the framework of the programme of activities conducted by the liberal and democratic group in the European Parliament (ALDE) on the occasion of their annual meeting, which this time was held in Donostia by invitation from the Basque Nationalist Party (PNV). Close to 200 persons headed by the group chairman and Brexit lead negotiator for the European Chamber Guy Verhofstadt, former Belgian prime minister, took advantage of this coordination meeting to make diverse institutional contacts, among them an encounter with Lehendakari Urkullu.